(Last Updated : 12.12.18). Check HPSC College Lecturer Screening Test Result, Cut-off Marks List and Interview Schedule 2018. Haryana Public Service Commission (HPSC) released Marks List of Assistant Professor Psychology, Political Science and Chemsitry for EBPG Category. Check here recruitment test result, interview schedule date and subject-wise. HPSC has already declared Marks List and Final Result of Assistant Professor - Philosophy, Physics, Political Science, Psychology, Chemistry History, Maths, Public Administration, Home Science, Economics, Computer Science, Hindi, Sociology, Sanskrit, Zoology, Botany, Bio-Technology, Music (I), Music (Vocal) and Fine Arts, Defence Studies, Mass Communication, Physical Education, Geology, Punjabi & Tourism. The screening test result of Botany, Fine Arts, Music (Vocal), Physical Education, Defence Studies, Punjabi, Mass Communication, Music (I), Geology & Bio-Technology has already been declared by the commission. Candidates who appeared in Assistant Professor (College Cadre) Screening Exam 2017-18 can check final/written test result subject-wise and category-wise. The qualified candidates can send hard copy of their documents within 15 days of the declaration of the result. See here HPSC Result, Cut-off Marks, Interview Dates/Schedule of Assistant Professor (College Cadre) Recruitment 2016-2017. HPSC declared revised final result of Assistant Professor Hindi on 27.09.2018. Check here latest recruitment test result and final result of Assistant Professor Physics, Political Science, Psychology, Chemistry, English, Economics, Home Science, Public Administration, Sanskrit, Hindi, Commerce, Sanskrit, Fine Arts, Music (V), Zoology, Bio-technology, Music (I), Defence Studies, Mass Communication, Physical Education, Geology, Punjabi & Tourism. Three times candidates of the vacancies have been qualified for Interview. 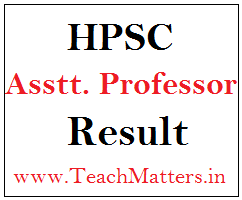 HPSC released Detailed Marks List for the post of Assistant Professor after recruitment test and interview. Here is subject-wise marks list of all candidates who appeared in written test for the post of College Lecturer. The Secretary, HPSC, Bays No. 1-10 Block-B, Sector - 4, Panchkula (Haryana). Time of Interview : 9:30 A.M.
For more information download the result and interview schedule at the above links. Interview admit cards are available for Assistant Professor (College Cadre) Interview 2018. Candidates can download their interview admit card as per the schedule. what are cut off marks for botany subject and what wll be the pattern of the interview?? what is the least no. in interview which may be given by interviewer in HPSC Assitant Professor out of 20 Marks.